Each turn, the first player rolls two six-sided dice and allocates one to the day-time and the other to the night-time. These are now fixed for this round and all players will use those results. Players select a card from their hand to use this turn and place it face-down on the table. Then, starting with the first player and going clockwise, each player turns over their selected card and executes their day action then their night action – the value on the relevant dice determine the value of these actions. For example, the first player rolls a 3 and 5 and allocates the 5 to the day action and the 3 to the night action. A player who plays a card with a day action of gold and a night action of move forwards, would take 5 gold (placing it one of their ship’s holds) and then move forwards 3 spaces. When a player moves, they must pay the cost shown on the space they move to (using gold or food). If a player doesn’t have enough, they pay what they can and move back one space and try paying for that space. This can mean a player may backslide quite a few spaces. Some spaces have no cost and the first player to reach these gets a bonus treasure card – some give special abilities like re-rolling battle dice, and the rest are actual treasure (the value of which is kept hidden as some is good and some is cursed so worth minus points). If a player lands on a space with another player’s ship then they fight. Each player can commit a number of cannon tokens (from their hold) and adds that to their die roll (which is values of 2, 4, 6, 8, 10 or instant win). If no instant win is rolled, whoever has the highest total wins and steals one hold of goods from the loser. The first player moves on each round. The game ends when one player completes a full circuit of the island. Players add up their gold plus any treasure cards plus players on the final spaces of the board scores up to 15 bonus points (and everyone else loses 5 points). The player with the most points wins. Overall, Jamaica is a light and fun racing game with a great theme. The day/night action system is simple but different and simple. There are good decisions to be made but it’s more about fast action rather than deep, tactical play. Selecting cards is quick because you only have 3 cards to select from but there’s still enough to think about because you have combine your needs with the cost of the spaces you may move to and where other players are (or may be when it’s your turn to move). Also, you need to manage the tokens in your ship’s holds so there is some resource management gameplay. There are only 5 slots for the 3 types of tokens (gold, food or cannon) and these can not be mixed. Also, if you want to put tokens in a hold, you must ditch any tokens already in that slot. With limited slots, you must balance the mixture of types as you need all 3 – food/gold for movement, gold for points and cannon for combat. I love the visual design of Jamaica. 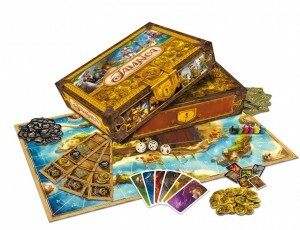 The box looks like a treasure chest and, when you take the lid off, it looks full of gold coins (as that’s what’s printed on the back of the rules). 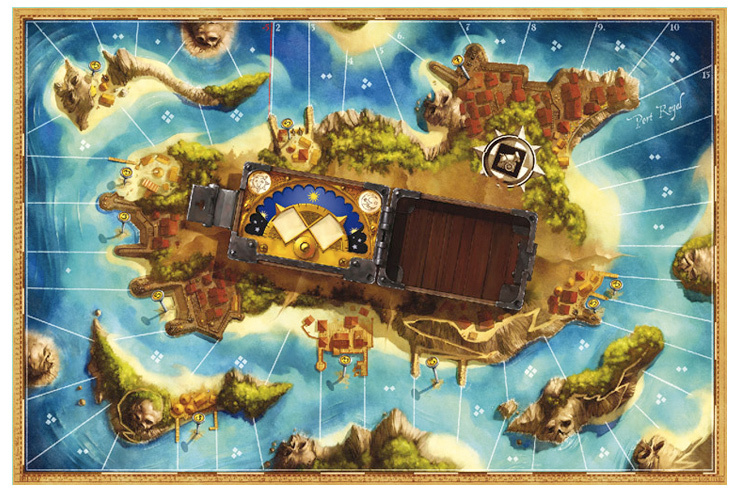 The fold-out rules are like a treasure map and a player’s action cards can be laid end-to-end to make one long panoramic scene. It’s all very cool. I can only see a couple of minor downsides. First, some players find it hard to work out which dice on the board is the day dice and which is the night dice because of the angle at which they are viewing the board. Those who view the board the wrong way up, see the dice back to front (night dice on the left but the night action is on the right of their cards). It’s not a major problem but it can take some getting used to, even with the markers on the board. I just suggest anyone new to the game (or gaming) sits so they view the board the right way up. Second, the battle dice has such a large range that luck plays a massive part – if its range was less then cannon would be much more influential, but that may just be more my personal preference. I think Jamaica plays better with more players as there’s more chance of players landing on the same spaces so more chance for combat and stealing goods. I haven’t played it 2-player yet but I like that there are rules for a ghost ship (an automated 3rd player) that means there are 3 ships on the board. I’d like to try out having more ghost ships too. If you’re looking for a serious pirate game then this isn’t the game for you. However, any gamer (serious or light) who wants a fun, light racing game which is colourful and refreshingly different will enjoy this game. This entry was posted on Wednesday, September 29th, 2010 at 1:31 pm	and is filed under Board Game Review, Board Games, Jamaica. You can follow any responses to this entry through the RSS 2.0 feed. You can leave a response, or trackback from your own site. As with most reviews of Jamaica, most of the comments seem to be about the graphics and visual elements. It’s definitely a pretty object, but the game is almost completely luck, a little less than Yahtzee or Chutes and Ladders, and at about the same level as Sorry. “Light” is a euphemism for the game. It is shallow dice rolling and card drawing. I have certain game friends who are drawn to pretty games, but I notice they don’t bring them very often to gaming events any more after the first play or two if they’re like Jamaica. This game works best for kids 8 to 12. I agree there’s a big luck factor but there’s still some interesting decision-making to be had making the best out of the die rolls and your action cards as well as working out who you could hit (or avoid). This won’t be enough meat for the more serious gamer – and I think you might be in that category. However, I think Jamaica ticks the boxes for several situations. In one of the groups I play in (all players aged 35-45), we had two guys who had not played any Eurogame before and this was a great introduction to the gaming world as we had a fun game with some truly humorous moments. I’ve also had a fun game with my other group, who are all very experienced gamers, when we played it as a light game after a very long and intense game. So, I’ve definitely found it has more to offer than just a roll-and-move kids’ game which I wouldn’t like either. Thanks for the feedback. I checked out your site and see you sell The Climbers in the US. I played the European version Die Aufsteiger at the start of this year and thought it was very good. We thought next time we should take photos of it and then put together a time-lapse animation of our game. What, would you say, is the pirate game that has stuck with you the most? Which one has been the most fun to play so far? Thanks for the comments. Great to hear you like the reviews. I think Merchants and Marauders wins the most meaty and serious pirate game to date. It just allows you to attack ships, trade between islands, search for rumours and attempt missions. Plus, the neutral ships and bounties (that can make them attack you) just combie to allow you to carry out pirate activities. Also, you can choose your own balance of being a piracy being a trader in a pirate world. I have yet to play Kuznia Gier’s “Pirates: The Governor’s Daughter” which (from reading the rules) looks more simplified than Merchants and Marauders as the game mechanics are more like a Eurogame and it’s not trying to deliver the variety and depth of a full-on piracy simulator – so it may be a good game which isn’t a direct competitior with merchants & Marauders. It’s currently sat on my shelf ready to play which I hope to do so in the next few weeks. I like Jamaica for what it is – simple and fun gameplay with a pirate theme but it’s not trying to deliver gameplay that emulates the full pirate life. Other pirate games in my collection like Buccaneer and Hispaniola are similar in terms of having a pirate theme (and some gameplay connection to piracy) but are really Eurogames with good mechanics and not trying to deliver a full pirate experience. So, I guess it depends on what you are looking for when asking what’s the most fun. If it’s based on the full pirate experience (and you have gamers willing to play at least medium complexity games) then I think Merchants & Marauders would be my choice. We really enjoyed it and will be playing it again next week. Thanks for the reply – that helps immensely! When thinking about M&M’s complexity, how would you compare it to something like Agricola? My typical gaming group wasn’t quite up for wading through its mechanics the last time we played, so I think using it as a benchmark for what they’re usually willing to play isn’t a bad idea. Since Agricola is not the same type of game, maybe that’s a bit like comparing apples to oranges? Yeah, it’s a diffficult comparison. Agricola is a very tight game and one wroing decision can have long-term impact on your progression. Also, therer’s a lot to read on all the different available tiles which need considering simultaneously when working out what resources to gather in order to acquire them. Merchants & Marauders is a lot more forgiving. It has lots of variety but is less tactically tight than Agricola and luck plays a part. It’s hard to say though – not knowing what games your group like and what your players are like too – and I don’t want to steer you wrong. Probably the best solution is take a read of the rules (at http://www.zmangames.com/boardgames/merchants_and_marauders.htm) and weigh it up. I think it’s not as heavy as Agricola but it does have breadth in its variety. Let me know how you get on.